I am a visual artist that uses many different mediums to express my creativity. Printmaking has been a twenty year passion, but I have expanded my creative endeavors to include watercolors, colored pencils, acrylics, ceramics and mixed media collage. My imagery is born from an undying love of nature and my experiences within it. 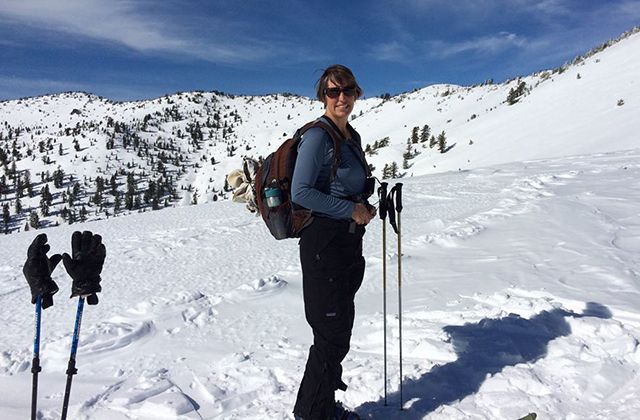 I have lived and played in the Lake Tahoe region for 20 plus years and during that time I have skied, hiked, biked and climbed my way through the Sierra Nevada Mountains. I never tire of the scenic beauty of this area and I am blessed to call it home. Traveling has also been a large part of my life and has influenced much of my artistic style. I have spent time in Southeast Asia, Indonesia, Thailand, Nepal, Patagonia, and Canada. My travels have allowed me to experience many cultures of the world and I have drawn from various religious symbols and beliefs to create my own spirituality. My art has always been very personal to my life and I use a lot of color and symbolism to capture that perfect "moment". I got an opportunity to teach art to children part-time at a private school in western Nevada. Being a mother of a young child nearing primary school age, I was drawn to the possibilities of art education and I jumped in head first. At the age of 37, I found myself going back to school and have since completed my K-8 elementary certification with a K-12 Art Endorsement from Sierra Nevada College. In August of 2010, I also completed a Masters Degree in the Art of Education. This experience has changed my life in many ways. I am forging a new path for myself, building upon an exciting career that incorporates my love for art, my dedication to bettering the education of our youth and my endless quest for higher knowledge. I teach primarily to foster creativity in my students and am always searching for new opportunities to express my own creativity. 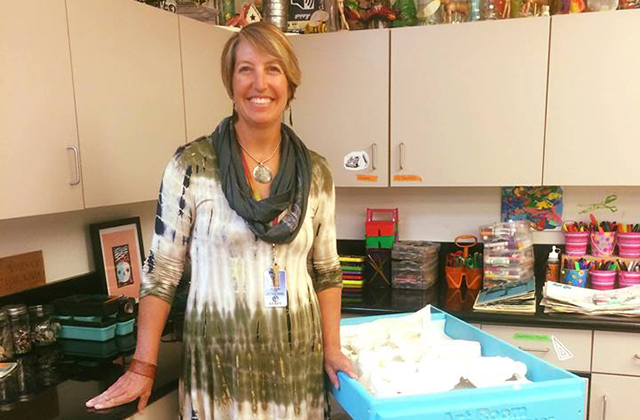 Alison has taught Preschool, elementary and middle school at Lake Tahoe School in Incline Village, Nevada since 2006. She advocates for the need for visual arts learning in early and elementary school education and recently completed a master thesis entitle "A Studio Based Approach to Fostering Creativity in Primary Education". The following talking points were taken from an article from School Arts magazine, October 2008. Art Education nourishes creative ability-As the world economy grows more competitive, our nation's future very much depends on those who have creative skills. As students engage in artistic explorations, they learn how to find original solutions to problems and discover innovative techniques. They are informed by risk-taking and use of the imagination. Art Education fosters useful communication skills-In today's world, images and sounds combine to form a new language. Complex graphics and fast-paced imagery communicate ideas that might otherwise be difficult to express. We all must learn how to use, understand, analyze, and judge these images. Art education prepares students with marketable skills for the world of work. The study of art develops qualities that employers say they need in workers. Students in art classes learn how to develop and deliver a product by adhering to high standards, engaging in analytical and creative thinking, acquiring a disciplined approach to the practice and refinement of skills, and working cooperatively. An education in art is important to America's ability to compete globally. Countries with which we compete ensure that their children have opportunities to cultivate their utmost mental, emotional, and technological capabilities, as well as to refine and master manual skills. Increasingly, 21st century careers require sophisticated visual understanding. Architecture, product design, computer imaging, communications and scientific investigations all rely on visual training. Art education improves student achievement I all areas of the curriculum. Art activity has the potential for positively engaging all students. Through their explorations and encounters with art, students can master a wide range of skills and academic concepts. Skills and attributes cultivated through art education-including creativity, imagination, problem-solving, critical thinking, self-expression and self-esteem-contribute to student achievement across the curriculum. Art education encourages self-discipline and persistence. The making of art teaches students the lessons of discipline, organization and hard work. Art education encourages the involvement of parents, community, and business in the schools. Art programs bring parents into schools. Every educator knows that there is no better way to bring child's education alive for a parent than to exhibit the students' products. Art education programs provide opportunities for partnerships with businesses, cultural institutions, local artists, and others to educate students and enrich communities. Art teaches young people about human nature and culture. The quality of civilization can be measured through its art and architecture. Art teaches cultural diversity in an increasingly diverse nation. By studying art, students develop their abilities to think critically, analyze, weigh meanings, and make judgments with an open mind and tolerance for diverse opinions. Art is basic to life. Art is the language of human expression, understanding, and functionality. Art conveys form and meaning to and from the world around us. We deal with art every day in such things as advertising, architecture, fashion, movies, and media. "If we value independence, if we are disturbed by the growing conformity of knowledge, of values, of attitudes, which our present system induces, then we may wish to set up conditions of learning which make for uniqueness, for self-direction, and for self-initiated learning."